Places to see at Mongpong: The Mahananda Wild Life Sanctuary is a must see when you are in Mongpong. The sanctuary houses wide variety of bird life like the Pintail duck, Bar-headed goose, Poachard, Brahminy duck, Mallard and others. Plus, the Teesta valley offers some breathtaking views of nature that you had somehow missed in the chaos and confusion of the city. The historical Coronation Bridge at Sevoke is also a great piece of attraction. Nearby attractions from Mongpong: The city of Siliguri is just 29 kilometers from Mongpong and the forests of Dooars are also nearby. So, you can definitely make a trip to these two places. Things to do at Mongpong: Enjoying the breathtaking views of the region and its natural beauties is perhaps the best thing that you can do. How to reach Mongpong: Mongpong is some 29 kilometers from Siliguri. It is better if you reach New Jalpaiguri railway station and from there, you can easily hire a car. Cars can also be hired from Siliguri. All the buses heading towards Dooars go via Monpong. Best time to visit Mongpong: You can visit Monpong during anytime of the year. Lodging and dining facilities at Mongpong: You can stay at forest department cottages and bunglows offered by the Government. They also offer one dining hall and dining facilities as well. Hi, I visited Mongpong. It is a lovely place. The Forest cottages here face the Teesta river from a high cliff. There is a patch of forest just in front of the cottages from where the train line to Assam passes. At night, when the whole jungle and river is sleeping, you can hear trains passing through the forests. 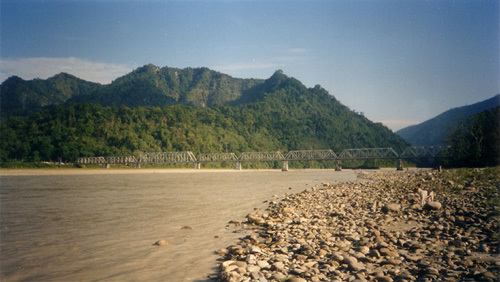 We even walked down to River Tista from the cottages crossing through the villages and sparse jungles to have a dip on Teesta. 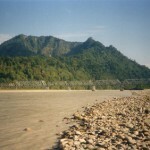 On the other side of Tista is the huge stretch of Mahananda Forest. Mongpong is a lovely place to unwind on a weekend. It takes 40 mins from NJP to reach Mongpong by car. You can also catch any local bus from Siliguri heading towards Odlabari or Sevoke Bridge to reach Mongpong. Mongpong is located just after Sevokeshwari Temple.